Nobody cares if a gay guy rocks strange effeminate clothes, its part of the stereotype picture we have of homosexual men. They are surposed to “act out” and try to brake all the heteronormative bounderies. 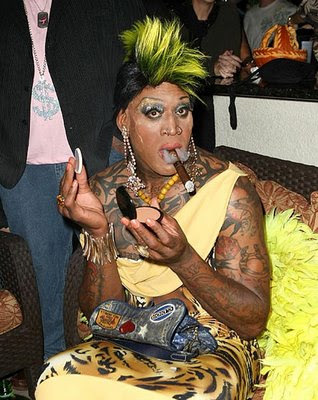 But when straight artists such as Prince or even better: basketball pros such as Dennis Rodman dress up in less conventional clothes its like stiking people in the eye with a stick! I’m totally fascinated by straight men who dare to wear unconventional clothes, they show that straight doesn’t always have to equal square and boring. So why don’t more guys dress in more exessive styles? MTV should have a programe called “ Pimp My Svenne” or maybe TV4 could have a “Bonde gets pimped”. We swedes always think we are much more open minded than other western cultures on issues regarding gender, so how come this has no effect on the way we dress? Why isn’t Zlatan or Prins Philip rocking make-up?!! Maybe a lot of men don’t approve of and don’t want to be assoiated with the pimp lifestyle. Selling hoockers and drugs isn’t EVERY young boys dream. But straight guys should defenitly try to have more fun dressing up. Paint your nails to match with your kicks, buy a pair of plastic red shoes or just grow a cool mustache, the possibilities are endles!! Stop being such a square and just get freaky with it!